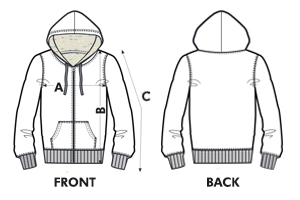 A comfortable and very soft hooded zip sweater, fairtrade and organic! The fluffy lining keeps you super warm on cold and windy days. We are totally enthusiastic about this winter jacket and can hardly wait for the next frosty days ;). Regarding the black version: Please note that it's is not a very deep black, but a little bit more greyish. The jacket is part of the Stanley&Stella collection and was produced in eco-friendly factories. The energy used by the factories comes from renewable sources. The cotton is 100 % organic and was manufactured under fair conditions. The farmers don't only grow cotton but also food plants. So they do not only depend on the cotton market. The jackets are shipped by land or sea. Apart from the ecological quality, Stanley&Stella's factories were also certified by the Fair Wear Foundation. The farmers carry a fair wage and receive premiums. Sania is 1,88 m tall and is wearing size XXL, Maria is 1,62 m tall and is wearing size M.